Magnesium deficiency in plant determined by test, observation, or known nutritional needs of certain plants and/or systems. 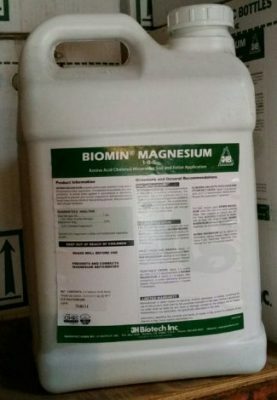 Biomin amino acid chelated magnesium provides easily absorbable and “plant friendly” magnesium for immediate use by the plant. Magnesium is important to the health and quality of the crop in many ways, including chloryphyll (energy production) and flavor enhancement.